The fourth Ariane 5 for liftoff in 2015 has begun its integration process at the Spaceport, maintaining Arianespace’s mission pace during another busy year of launch activity from its French Guiana operational base. This heavy-lift vehicle will be used for Flight VA225 in August, which will deliver two relay satellites – EUTELSAT 8 West B and Intelsat 34 – to geostationary transfer orbit. The mission’s designation signifies Ariane’s 225th mission since the European-built series of launch vehicles began operation in 1979. The cryogenic core stage for Flight VA225’s Ariane 5 is shown suspended over its mobile launch table in the Spaceport’s Launcher Integration Building. Build-up of the Ariane 5 is following well-established procedures at the Spaceport, with its cryogenic core stage initially positioned over one of two operational launch tables, followed by the mating of two solid propellant boosters. This occurred in the Spaceport’s Ariane 5 Launcher Integration Building, clearing the way for an initial vehicle “top-off” with installation of its cryogenic upper stage and equipment bay atop the core stage. Ariane 5 will then be made ready for transfer to the Spaceport’s Final Assembly Building, where the EUTELSAT 8 West B and Intelsat 34 payloads are to be installed. 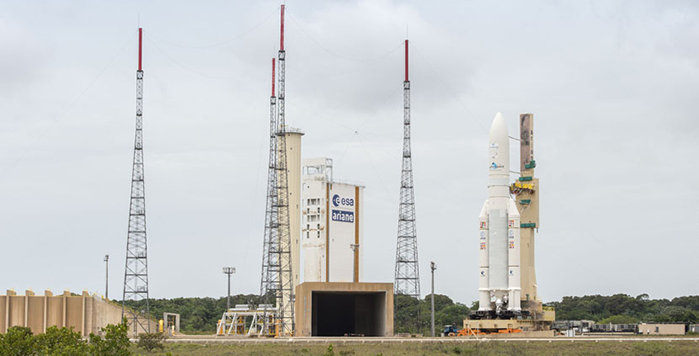 The Final Assembly Building currently is occupied by another Ariane 5 that will be rolled out next week for Arianespace’s Flight VA224, which is to loft the Star One C4 telecommunications satellite for Brazil and Europe’s MSG-4 meteorological platform on July 8. For Flight VA225, EUTELSAT 8 West B will occupy the upper passenger position in Ariane 5’s dual-payload configuration. It is designed to bring powerful new satellite broadcasting resources for the Middle East and North Africa, utilizing a 5.8-metric-ton-class relay platform manufactured by Thales Alenia Space. Equipped with 40 operational Ku-band transponders designed primarily to serve direct-to-home (DTH) markets, the high-capacity EUTELSAT 8 West B spacecraft is to be located at a geostationary orbit slot of 8 deg. West, joining satellites already operated at the adjacent 7 deg. West position by Eutelsat and the Egyptian satellite company Nilesat. EUTELSAT 8 West B also will introduce a C-band mission to the 8 deg. West orbital slot, with 10 operational transponders connected to footprints covering the African continent and reaching west to South America. Eutelsat Communications – which will operate EUTELSAT 8 West B after its launch by Arianespace – calls the 7/8 deg. West “video neighborhood” one of the most dynamic in the global satellite TV market, with a rapidly growing audience and channel line-up. An estimated 52 million homes in North Africa and the Middle East already are equipped for DTH reception of more than 1,200 Arabic and international channels broadcast at this position by Eutelsat and Nilesat. Flight VA225’s other passenger, Intelsat 34, will be installed in the lower payload position on Ariane 5 and is to have a liftoff mass of more than 3 metric tons. Specially designed to meet the media distribution requirements of leading programmers for Latin America, this satellite also will support advanced broadband service to maritime and aeronautical providers serving the North Atlantic. Intelsat 34 was built by SSL (Space Systems/Loral) of Palo Alto, California and is designed to deliver service for 15 years or longer. It will bring replacement relay capacity for two other satellites at 304.5 degrees East longitude. The Ariane 5 mission with Intelsat 34 and EUTELSAT 8 West B is to be the seventh Arianespace flight of 2015 with the company’s launcher family, composed of the heavy-lift Ariane 5, medium-lift Soyuz and light-lift Vega. In addition to Arianespace’s upcoming Flight VA224 mission with Ariane 5 on July 8, the company’s five missions performed so far in 2015 are: Vega Flight VV05 on June 22 with Sentinel-2A; Flight VA223 with Ariane 5 on May 27, orbiting DirecTV-15 and SKY México-1; Ariane 5’s Flight VA222 on April 26, carrying THOR 7 and SICRAL 2; Soyuz Flight VS11 on March 27, which orbited two Galileo Full Operational Capability satellites; and Vega Flight VV04 on February 11, performing a suborbital mission with the Intermediate eXperimental Vehicle (IXV) spaceplane. One of Ariane 5’s two solid propellant boosters for Flight VA225 is transferred from the Spaceport’s preparation area for integration with the vehicle’s core cryogenic stage in the Launcher Integration Building. Eutelsat Communications (ETL) announces that its latest satellite, EUTELSAT 8 West B, has arrived at the European spaceport in French Guiana and is now in final stages of preparation for launch by an Ariane 5 rocket on 20 August. EUTELSAT 8 West B is poised to open a new chapter of expansion in vibrant broadcast markets in the Middle East and North Africa. It will shore up the ⅞° West position, hosting Eutelsat and Nilesat satellites that is the point of reference for TV viewing in over 52 million homes from Morocco to the Gulf. With the launch of this new satellite, Eutelsat is ensuring that bandwidth is available for broadcasters to deliver High Definition today and the immersive viewing experience of Ultra HD in the future. Built for Eutelsat by Thales Alenia Space, the 5.8 tonne satellite is equipped with 40 operational Ku-band transponders optimised to serve DTH markets in North Africa and the Middle East. It will also introduce a C-band mission of 10 operational transponders connected to a vast footprint covering the African continent and reaching west to South America. The launch is scheduled for 20 August during a launch window opening at 8:10 pm UTC and closing at 12:56 am UTC on 21 August. The satellite will go into full commercial service early October following checks to validate its performance in orbit. Established in 1977, Eutelsat Communications (euronext paris:ETL)(isin code:FR0010221234) is one of the world's leading and most experienced operators of communications satellites. The company provides capacity on 37 satellites to clients that include broadcasters and broadcasting associations, pay-TV operators, video, data and Internet service providers, enterprises and government agencies. Eutelsat’s satellites provide ubiquitous coverage of Europe, the Middle East, Africa, Asia-Pacific and the Americas, enabling video, data, broadband and government communications to be established irrespective of a user’s location. Headquartered in Paris, with offices and teleports around the globe, Eutelsat represents a workforce of 1,000 men and women from 32 countries who are experts in their fields and work with clients to deliver the highest quality of service. The Antonov An-124 cargo jetliner approaches Cayenne’s Félix Eboué Airport for landing, completing an Atlantic Ocean crossing from France with the EUTELSAT 8 West B satellite payload to be orbited on Arianespace Flight VA225. 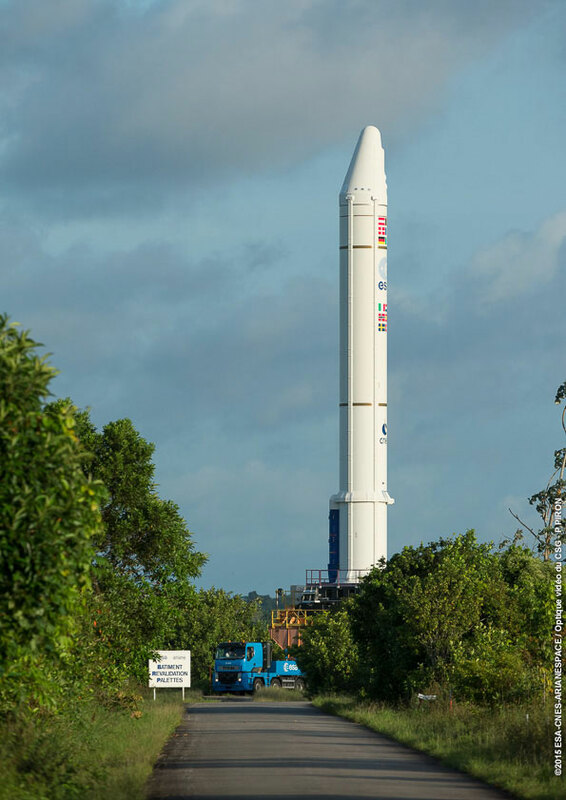 The EUTELSAT 8 West B telecommunications satellite for Arianespace’s next Ariane 5 mission is now in French Guiana, enabling payload preparations to begin for a scheduled August 20 flight from the Spaceport. 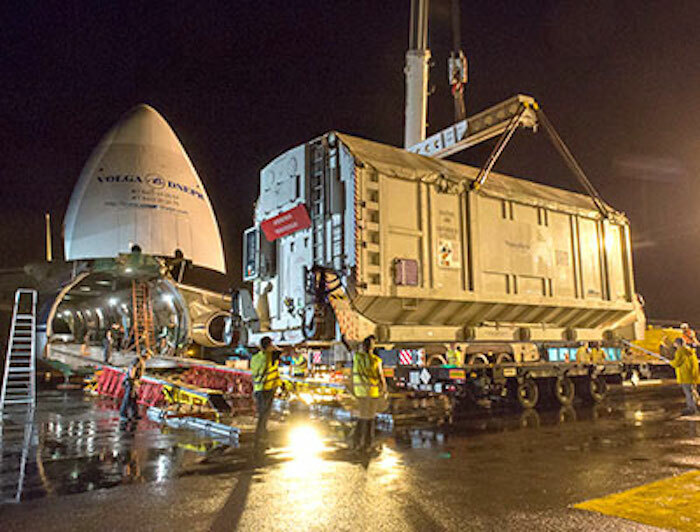 This relay platform for Eutelsat Communications was transported from Nice Airport in France aboard a chartered Antonov An-124 cargo aircraft, which arrived in French Guiana at Cayenne’s Félix Eboué Airport. After transportation by road to the Spaceport, the Thales Alenia Space-built EUTELSAT 8 West B will undergo final checkout and integration with Ariane 5 for liftoff from the South American launch facility – where Arianespace operates its family of the heavy-lift Ariane 5, medium-weight Soyuz and light-lift Vega vehicles. The protective shipping container with EUTELSAT 8 West B is unloaded at Félix Eboué Airport, readying it for a transfer by road to the Spaceport. On the upcoming mission, which is designated Flight VA225 in Arianespace’s numbering system, EUTELSAT 8 West B will occupy the upper passenger position in Ariane 5’s dual-payload configuration. The 5.8-metric-ton-class relay platform is designed to bring powerful new satellite broadcasting resources for Eutelsat Communications to the Middle East and North Africa – equipped with 40 operational Ku-band transponders primarily to serve direct-to-home (DTH) markets. EUTELSAT 8 West B also will introduce a C-band mission to the 8 deg. West geostationary orbital slot, with 10 operational transponders connected to footprints covering the African continent and reaching west to South America. This high-capacity spacecraft is to join satellites already operated at the adjacent 7 deg. West position by Eutelsat and the Egyptian satellite company Nilesat, and will go into full commercial service early October following a checkout to validate its performance in orbit. Joining EUTELSAT 8 West B on Arianespace’s Flight VA225 is Intelsat 34, built by SSL (Space Systems/Loral) for Intelsat, which is to have a liftoff mass of more than three metric tons. Specially developed to meet the media distribution requirements of leading programmers for Latin America, Intelsat 34 also will support advanced broadband service to maritime and aeronautical providers serving the North Atlantic. The August 20 liftoff with Intelsat 34 and EUTELSAT 8 West B will maintain Arianespace’s sustained mission pace in 2015, and follows the company’s six launches performed so far this year, which have carried a total of 10 payloads. These were: Ariane 5 Flight VA224 on July 15 (orbiting Star One C4 and MSG-4), Vega Flight VV05 on June 22 (Sentinel-2A); Flight VA223 with Ariane 5 on May 27 (lofting DirecTV-15 and SKY México-1), Ariane 5 Flight VA222 on April 26 (with THOR 7 and SICRAL 2), Soyuz Flight VS11 on March 27 (which orbited two Galileo Full Operational Capability satellites); and Vega Flight VV04 on February 11 (performing a suborbital mission with the Intermediate eXperimental Vehicle spaceplane). 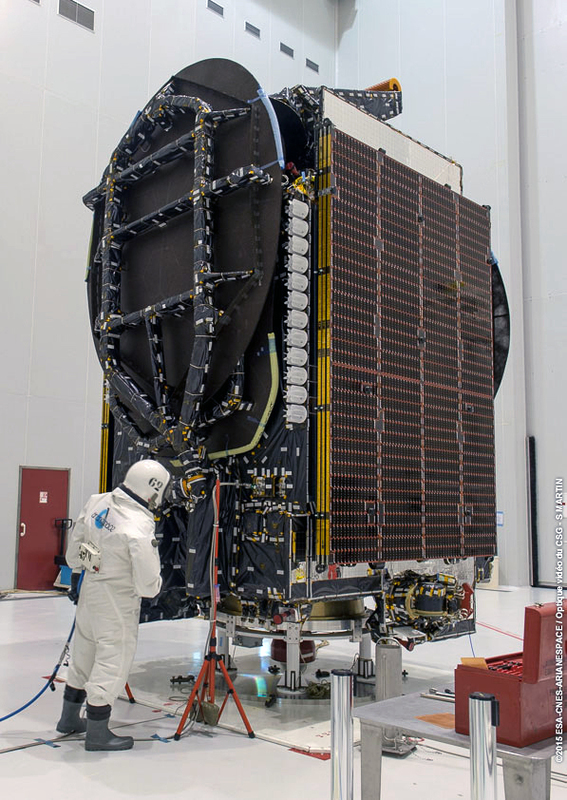 Payload preparations for Arianespace’s next Ariane 5 launch are now in full swing, with the mission’s two satellite passengers – EUTELSAT 8 West B and Intelsat 34 – undergoing checkout procedures at the Spaceport. These pre-launch activities kicked off this month, following separate arrivals of the two spacecraft – both of which were delivered to French Guiana’s Félix Eboué Airport via cargo jetliner. After their subsequent transfers by road to the Spaceport, preparations for EUTELSAT 8 West B and Intelsat 34 commenced inside the facility’s S5C building. Designated Flight VA225, this upcoming mission will mark the seventh liftoff in 2015 by a member of Arianespace’s launch vehicle family – which consists of the heavy-lift Ariane 5, medium-size Soyuz and lightweight Vega – as well as the fourth liftoff this year using a workhorse Ariane 5. EUTELSAT 8 West B – which will be operated by Eutelsat and the Egyptian satellite company Nilesat – will occupy the upper passenger position in Ariane 5’s dual-payload configuration. Produced by Thales Alenia Space, it is designed to bring powerful new satellite broadcasting resources for the Middle East and North Africa, primarily serving direct-to-home (DTH) markets. Flight VA225’s other passenger, Intelsat 34, will be installed in the lower payload position on Ariane 5. It was built by SSL (Space Systems Loral) for operator Intelsat to meet the media distribution requirements of leading programmers for Latin America. In addition, the spacecraft will support advanced broadband service to maritime and aeronautical providers serving the North Atlantic. 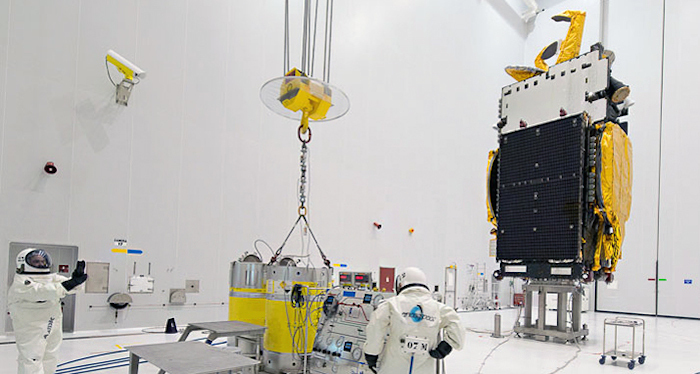 During activity in the Spaceport’s S5B preparation hall, the EUTELSAT8 West B spacecraft for Eutelsat Communications is being fueled for Arianespace’s next Ariane 5 launch, which is planned to lift off August 20 from the Spaceport. Eutelsat Communications’ EUTELSAT 8 West B telecommunications satellite is being “topped off” this week at the Spaceport, in preparation for its August 20 launch from French Guiana on Ariane 5 Flight VA225. Fueling activity for the EUTELSAT 8 West B spacecraft is occurring in the S5B preparation hall at Arianespace’s South American operations base, readying the satellite for its subsequent integration in the upper position of the Ariane 5 heavy-lift workhorse’s dual-payload configuration. Built by Thales Alenia Space, EUTELSAT 8 West B is a 5.8-metric-ton-class relay platform that features 40 operational Ku-band transponders to bring powerful new satellite broadcasting resources to the Middle East and North Africa – primarily to serve direct-to-home markets. It will also introduce a C-band mission to the 8 deg. West orbital slot, with 10 operational transponders connecting to footprints covering the African continent and reaching to South America. Joining EUTELSAT 8 West B as the lower passenger on next month’s Ariane 5 mission is the Intelsat 34 satellite for operator Intelsat. The SSL (Space System Loral)-produced three-metric-ton spacecraft – which also is undergoing preparation in French Guiana – will help meet the media distribution requirements of leading programmers for Latin America, as well as supporting advanced broadband service to maritime and aeronautical providers serving the North Atlantic. EUTELSAT 8 West B’s fueling for Flight VA225 is part of the busy pace of operations across the Spaceport in support of Arianespace’s 2015 mission cadence. In parallel, payload and launcher preparation activity is underway for three other missions: Soyuz Flight VS12 on September 10; another Ariane 5 launch (Flight VA226) in September, and Vega Flight VV06, which is planned for November. Intelsat 34 is “topped off” in the Spaceport’s S5 payload preparation facility, readying the satellite for its upcoming integration on Ariane 5. The second passenger for Arianespace’s next Ariane 5 flight has been fueled at the Spaceport, completing another major step for the August 20 launch from French Guiana. This was the final stand-alone operation with the Intelsat 34 satellite before its integration on the launcher, and it occurred in the Spaceport’s S5 payload preparation facility – conducted by personnel from spacecraft manufacturer SSL (Space Systems Loral), who were outfitted in specialized protection suits. The careful process ensured that sufficient propellant was loaded for Intelsat 34’s mission lifetime of more than 15 years, while maintaining the satellite’s targeted mass of 3,300 kg. at liftoff in the lower position of Ariane 5’s dual-passenger payload arrangement. Intelsat 34 will be utilized by satellite services provider Intelsat to meet the media distribution requirements of leading programmers for Latin America. In addition, the spacecraft will support advanced broadband coverage for maritime and aeronautical providers serving the North Atlantic. 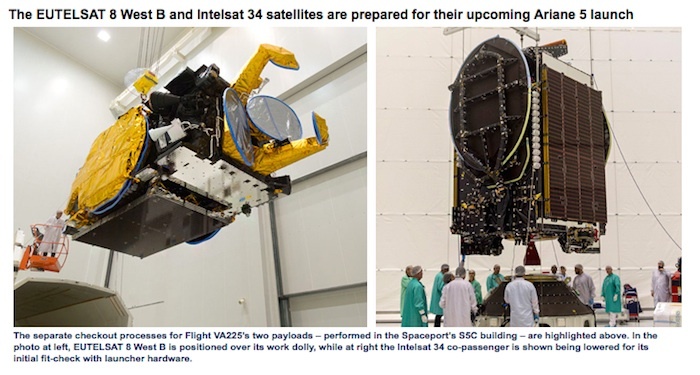 For the August 20 mission on Ariane 5 – designated Flight VA225 in Arianespace’s launcher family numbering system – Intelsat 34 is to be delivered to geostationary transfer orbit along with the 5,800-kg.-class EUTELSAT 8 West B broadcast relay platform, which will be operated by Eutelsat and the Egyptian satellite company Nilesat. EUTELSAT 8 West B was fueled in separate activity at the Spaceport late last month. Flight VA225 will continue Arianespace’s sustained operational pace. In addition to being the company’s fourth launch in 2015 with the Ariane 5 heavy-lift workhorse, Arianespace has performed two light-lift Vega missions this year, along with one utilizing its medium-weight Soyuz vehicle. 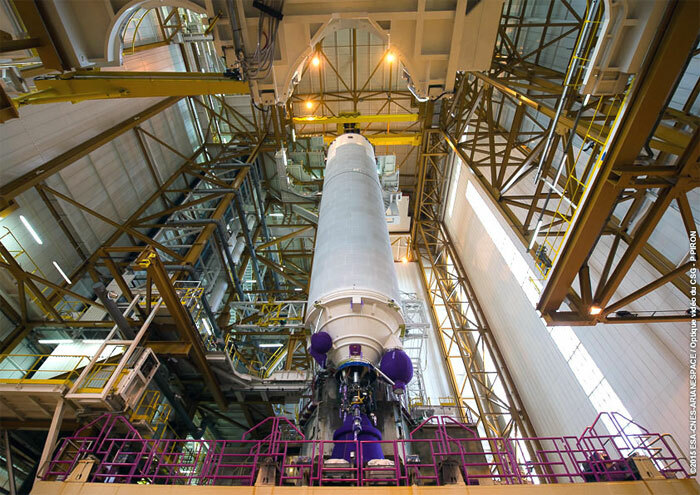 The Ariane 5 nears completion of its transfer from the Spaceport’s Final Assembly Building – where this heavy-lift vehicle received its EUTELSAT 8 West B and Intelsat 34 payloads – to the ELA-3 launch zone. Arianespace’s fourth Ariane 5 for liftoff in 2015 moved out to the launch zone in French Guiana today, clearing the way for tomorrow’s mission to geostationary transfer orbit for two long-time customers: Eutelsat and Intelsat. This rollout from the Spaceport’s Final Assembly Building marks one of the final milestones in preparations for Flight VA225, which is the seventh mission to be conducted by Arianespace at French Guiana so far this year. With an overall duration of just under 42 minutes from the South American liftoff to the release of EUTELSAT 8 West B and Intelsat 34, Flight VA225 will be carrying a total payload estimated at 9,922 kg. – including the two satellites’ liftoff mass, along with hardware for Ariane 5’s dual payload deployment system. Arianespace has been providing launch services for more than 30 years on behalf of the mission’s two satellite operators: Paris, France-based EUTELSAT, the leading telecommunications operator in Europe, North Africa and the Middle East; and Intelsat, the world’s top provider of satellite services in terms of revenues and in-orbit capacity, whose administrative headquarters are in McLean, Virginia, USA. Riding in Ariane 5’s upper position is EUTELSAT 8 West B, to be deployed first during the flight. Built by Europe’s Thales Alenia Space, this relay platform will bring powerful new satellite broadcasting resources to the Middle East and North Africa – primarily serving direct-to-home markets from an 8 deg. West orbital slot. It also is to introduce a C-band mission to this geostationary orbit position, covering the African continent and reaching to South America. In the lower passenger position on Ariane 5 is the 3.3-metric-ton Intelsat 34, which will be utilized by Intelsat for the media distribution requirements of leading programmers for Latin America – operating from an orbital slot of 304.5 deg. East. This relay platform, produced by SSL (Space Systems Loral), also is to support advanced broadband coverage for maritime and aeronautical providers serving the North Atlantic.